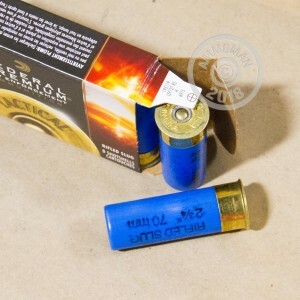 Add some reach and power to your smoothbore 12 gauge with these 2-3/4" shells from Federal Premium Ammunition. 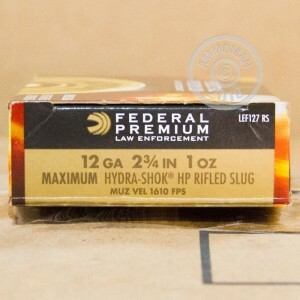 Each shell in this 5 round box fires a 1 ounce hollow point slug at a high muzzle velocity of 1,610 feet per second. These shells are assembled at Federal's Anoka, Minnesota headquarters. They're a great choice for hunting or defense in sparsely populated areas. 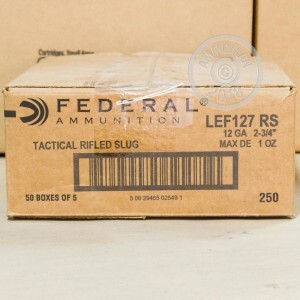 AmmoMan.com is your source for ammunition in quantity at a reasonable price. Place an order today for $99 or more to qualify for free shipping! I am stashing the ammo for now!